Residents of the Red Lake reservation in northwestern Minnesota are struggling to understand a shooting that left 10 people dead and seven injured. The FBI and tribal officials answered questions about the shooting in detail Tuesday in Red Lake. Red Lake, Minn. — Red Lake residents look stunned. They're shocked by the deaths of 10 members of their close-knit community, and overwhelmed by the media horde that descended on the small town. Angela Ishem and her daughter Alicia talked with reporters outside the Red Lake Law Enforcement Center. 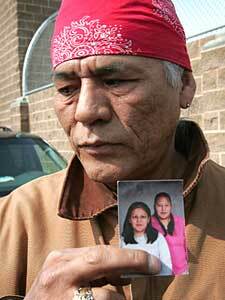 Ishem had three children at the Red Lake High School. She says her son narrowly escaped the shooting. "My son was coming out of his class. One of his friends walked in front of him, and he got the shot we thought was meant for my son," Ishem says. "They're really shook up and afraid for their friends." Ishem says it took nearly two agonizing hours to learn her children were safe. "The kids were put on lockdown at the school, so the parents didn't know whose kids were hurt or whose kids were safe," Ishem says. "My daughter called home about 40 minutes after the lockdown, and then it took her another 40 minutes to find her two brothers. Thank God they're all safe." Her daughter Alicia says she hid in a classroom during the shooting. She says she knew 16-year-old Jeff Wiese, and thought him to be a pretty nice guy. Other students have reported Wiese threatened to shoot up the school several months ago. Law enforcement officials could not confirm those threats. The FBI says Wiese used a .22 caliber gun to shoot his grandfather Daryl Lussier and Lussier's companion. Lussier was a longtime Red Lake tribal police officer. Wiese then took his grandfather's police squad car, his bulletproof vest and guns. He drove to the high school, where he entered through a set of metal detectors. Wiese shot an unarmed security guard, a teacher and several students. He exchanged fire with a Red Lake police officer before ducking into a classroom. There, Jeff Wiese shot himself. Ten people, including the gunman, are dead. Seven people are injured. Red Lake Tribal Chairman Buck Jourdain looked visibly shaken when he appeared before reporters. "Our community is devastated by this event," Jourdain said. "We have never seen anything like this in the history of our tribe, and without doubt these are the darkest days in the history of our people. We are in utter disbelief and shock." Jourdain says he's been overwhelmed by the outpouring of support from around the country. He says trauma counselors are traveling to Red Lake, and will provide counseling for any Red Lake resident who seeks help. The offers of help came from far and near. Beltrami County commissioner Joe Vene says the county is offering whatever help the neighboring Red Lake nation needs. "We're stunned, we're stricken, we're terribly aggrieved at this, because we are neighbors and friends and we see each other on a regular basis," Vene says. "We have a lot of geography and a small population, so we get to know each other up here." Vene says Beltrami County is providing law enforcement and social service support. Minnesota U.S. Attorney Tom Hefflefinger says he's pleased by the outpouring of support from state and local agencies. He says Red Lake will need support for a long time. "This community is in shock. I've been here many many times and I've never seen it this quiet," says Heffelfinger. "I am very concerned there be resources in place for the police department, the school and the public. There isn't a person in Red Lake that hasn't lost at least a cousin. That is the tragedy of this type of crime in this close a community. A community where family is everything." Heffelfinger says the federal government will ensure trauma counseling services are available on the reservation for as long as they are needed. Heffelfinger says it appears the school had done a very good job of putting security measures in place, and had practiced for just such an event. Family connections on the reservation are strong. It's hard to find any member of the Red Lake band who's not lost a relative in this shooting. Some elders say healing must begin. There were two prayer ceremonies marking the deaths Tuesday. The next step for the Red Lake community is to begin burying 10 of its members.